Wild Onions is an annual publication funded by The Doctors Kienle Center for Humanistic Medicine, Pennsylvania State University College of Medicine. 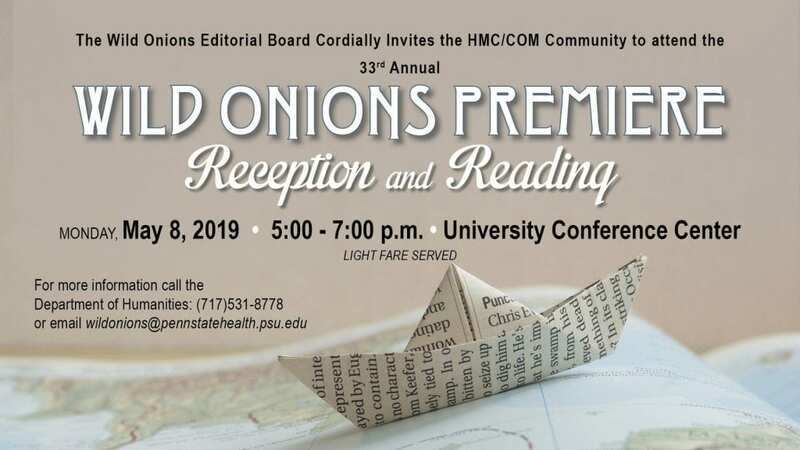 It is a journal of poetry, prose, and visual art, created by members of the Penn State Milton S. Hershey Medical Community. Most entries will pertain to some dimension of medicine (for example, the experiences, observations, and reflections of patients, nurses, physicians, medical students, family members, hospital staff, volunteers, visitors, etc. ), but we invite submissions on all topics. Wild Onions is seeking striking images from the bedside, clinic, or lab bench, whether or not these were originally intended as artwork. Entries must be original work not published previously and may take any form: fiction, non-fiction, poetry, drama, cartoons, graphic novella or short story, photography, drawings, paintings. The Doctors Kienle Center for Humanistic Medicine funds the publication and distribution of Wild Onions. The aim of The Doctors Kienle Center is to advance the appreciation, knowledge, and practice of humane and humanistic medicine, defined as health care that is sympathetic, compassionate, and effective. Wild Onions serves this goal by encouraging literary and artistic work that seeks to describe and understand, with empathy, the experiences of giving and receiving health care.